I took this picture because it is, without a doubt, the quintessential Jason. Playing a song in his railroad cap on a Saturday in his dad's old shirt. I love it so very much. I wish I could remember the song he played because I'm sure that would be perfectly J as well. 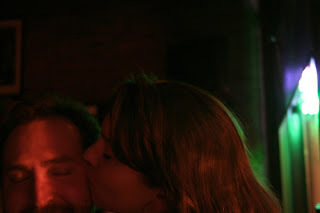 I had to post this pic my friend Gena took of me and Jason last Friday night. I love it so much I want to marry it. I'm ate way too much beef this weekend. Yipes. BUT it was all pretty good. My personal contribution to the lost weekend of beef was this. My first attempt at Stroganoff. It was okay. Not the best but okay. I also made ceasar salads with anchovies for Jason. God those things look gross but he loved them. Tonight I'll probably be eating left overs of beef. God. I hope I don't heart attack. Here is my cake I baked. I'm sorry for the BIG gap in blogging (three people who read this and Matt) but my new job is all new and joby. I love it! Things are great. Jason is great. Work is great. My new grey pants are great. The Packers are SUPER great. I'm just very happy and actually also kind of healthy for once. Jason has been trying some new stuff too but he's good at things right out of the starting gate. That's just how he is. So he made this. Pork loin and veggies and mashed potatoes. It was.........you guessed it! Great. That's about all and I have to get back to work but I promise to blog more now that I have my routine down here a little better. OH so yeah I'm going to try and make Monique's green chicken soup for the Packer game on Sunday. (that's not what it's called, it's actually green chili chicken soup, but I accidentally called it that last night and I think it's funny. PLUS if I tell people that's what I'm fixin them they won't have high expectations and then might just be WOW'd right out of their socks. We'll see. Stay tuned for updates.